We packed a lot of activity into 2014. We adopted a kitten, Katje, to join Rafael; played on the Florida beaches, wandered around the zoo and amusement parks; took in a baseball game and a Renaissance Faire; and had a wonderful time traveling to London and exploring that amazing city. We also started our third year of homeschooling. We wish you a blessed Christmas season and hope that 2015 brings you joy and happiness. Not an awesome letter by any stretch of the imagination, but it hit the highlights and made her happy. I added a photo of her in London, on the Queen’s Walk by the Thames, waving a Union Jack with Big Ben in the background. Printed off three to a page, cut them up, stuffed them in the envelope with the photo card, and we were good to go. It’s Christmas again. Another one without you and that seems impossible to me. Thought you’d like to know that we’re having cinnamon rolls for Christmas morning breakfast again – Beary already asked because she loves that tradition you and I started so many years ago…all because I didn’t want to cook on Christmas morning. We added some new ornaments to the tree and I wish you could see them because I know you’d love them – especially the one from Buckingham Palace. It’s a Palace Guard and I set him watching over your ornaments to keep them safe and protected; I just like feeling that something is taking care of them, nestled in the green branches, while I sleep. Rudolph and all his pals are still singing under the tree, except Hermy won’t work this year, even with new batteries, and that makes me sad because his song is the one I most want to hear: “Why am I such a misfit?” I could sure use his squeaky elf voice singing to me right now because I feel like such a misfit at this season. I get cards with photos of happy, smiling families, and I tape them up around the dining room entrance and pass under all that joy every time I go to the kitchen, but inside, it’s hard. It’s hard to share the joy when all I want is a card with a Christmas photo of my whole family – you and me and the Bear – all together again, like always. I feel like I don’t fit in at Christmas, this season of joy and merry and family – because you’re gone and it feels like our family shattered and scattered like an ornament knocked from the top of the tree. Everywhere around me, there are bits of tradition and bits of my heart and bits of our Bear’s spirit – and even if I glue all those bits back together, something is still missing…You. I planned a jolly season, Kev, a season that you would be so proud of. Our Elf on the Shelf has been up to some antics like you wouldn’t believe and our little girl is so caught up in the magic; it’s breathtaking to see. And I took her to see “A Christmas Carol” – she loved it, Baby. She loved every bit of seeing the actors on stage and the story unfolding: “God Bless Us, Every One!” And we saw “White Christmas” on the big screen and munched buttery popcorn and Junior Mints. And I surprised her with a golden ticket for an after-bedtime Christmas lights scavenger hunt. And we’ve done our Jesse Tree and read of the miraculous, unwrappable gift of love God gave us. And we’ve made sugar cookies and gingerbread men, and decked the halls, and raised the roof with our caroling. But all these things that we did to fill our Christmas with joy and love couldn’t fill the space you left behind. There’s still an emptiness, Kev, because you’re not here with me. Taking a deep breath, I relaxed my hunched-up shoulders, made little circles with my head to loosen up my neck, and plunged in. Time to get this Christmas card started, though it didn’t feel like it would be any easier than last year’s card – the emptiness still echoed in my heart. “Let’s see which photos look good, how ‘bout, Bear?” I dragged a couple of photos into the card template. So far, so good. Our kitties, Katje and Rafael, looked cute curled up under the Christmas tree. My girl fairly beamed perched on Santa’s knee, the two looking for all the world like long-lost, but finally reunited, BFFs. Looks good, I thought to myself. Then I dragged the photo of the two of us into the template and I wanted to bury my face in my hands. I sighed. And so I was. At least my mouth was. But my eyes? My eyes looked empty, lost, shadowed. Sad. In all of those photos, my eyes lit up, sparkled, shone with love. Mostly because I was giggling at the silly antics my two photo-phobic goofballs got up to between shots. Both of them whined and fussed and dragged their feet as I set up the tripod and background, but as soon as I’d set the timer on the camera, the goofy faces began. Eyes crossed or fingers stuck in noses or tongues sticking out – they’d laugh and cut up and I’d helplessly, laughingly, beg, “C’mon, guys! Just a nice smile in this one, and we’ll be done. Okay?” It was like herding cats. And you can see it in the photos. You can see the barely-contained hilarity, the big guffaw of laughter that burst out after the camera flashed. You can see how very much love can be captured in just a fraction of a second, and when you multiply just that fraction of a second of love by all the seconds and minutes and hours we were together – well, that’s just a mind-boggling amount of love. But now? Now I see the barely-contained grief, the under-eye ravages left from crying myself to sleep, the smile that tips the corners of my mouth but can’t quite convince the rest of my face to look happy. I see loneliness and sorrow and resignation. I see a me that I don’t recognize, because she looks nothing like the laughing wife and mother of Christmases past. I thought — hoped — this year would be different. Last year was so hard; my grief was fresh and nothing felt right no matter how hard I tried for my girl. I was so relieved when Christmas was over and I could stop forcing the merriment. But the year flew by and now it’s Christmas again and I cry out, “God, help me!” because it doesn’t feel any different, any better, no matter how hard I try. I’ve gotten better at setting my grief aside sometimes, better at living this new life. But I still miss Kevin, more than probably anyone ever guesses when they see me out and about. I make candy, and sing carols, and buy presents, and carry on all our Christmas traditions, but never without thinking about the man who helped me create those very same traditions. The man who loved it all – from the magic of Santa to the miracle in the manger. I looked at it again, the photo of the two of us. I saw my beautiful daughter, face glowing with her Daddy’s smile and her Daddy’s sparkling eyes, graceful and poised. But there in the black and white photo, winter trees bare behind us and no colors to distract, I saw something I’d missed before. The sad eyes were there, yes, always, but now I saw more. I saw a connection, two aching souls figuring out how to live with the bruises of grief. I saw the closeness the two of us have forged over the last twenty months, hard-earned through tears and misunderstandings and forgiveness and acceptance. I saw quiet beauty and immeasurable love. There wasn’t the merriment and mayhem of past Christmas card photos, but that’s okay – we’re just not there yet. A full life in the emptiest of places. A life with my girl doing the things her Daddy would love, if he were here with us. A life where we grow closer to each other and closer to God as we carry on in this world where something is missing. Yes, a full life in the emptiest of places. I hope that’s what shows in our Christmas card this year. The overcast sky allowed only a thin grey light to pierce the early morning shadows. I squinted my eyes, straining to make out the words in the book I’d been reading when the electricity snapped off. Rain fell steadily outside the window. It looked and felt more like a warm spring rain, even though the calendar showed us quickly reaching the end of the year. How could it be almost December already? Unless I grab a flashlight to aim on the small print in this book, I thought, my reading is over until the electricity comes back on. I looked over at my daughter on the couch, her face lit up with the light from her iPod. She played Doodle Jump while the cats took advantage of the rare moment of peace and curled up on a cozy throw close by. As long as the battery held out, she was good for a while. The only sounds in the dim front room were the electronic sproings and beeps from her game and the soft splat of raindrops on the dead leaves outside the window. There was a brief surge of light, a flicker of electricity that quickly went black again, but was on long enough to show me that the Christmas tree had been turned on when we lost power. My girl must’ve turned on the tree lights when she woke up earlier. We’d just put it up the weekend before, too anxious to get the Christmas season started to wait until after Thanksgiving like we usually did. With holiday songs streaming from the TV and those darn cats batting at every strand of beads I unwound, we’d made an afternoon of giggling and dancing and decorating the tree. Each ornament I handed her had its own story, and I reached deep into the past, into the story of her and Kevin and me, digging the treasured memories out one by one to present to her: this one from our trip to Chicago, and this one from Orange Beach, and this one from the year she loved Thomas the Tank Engine so much. Her beloved Dora the Explorer appeared on quite a few ornaments; so did Kevin’s New York Yankees and Dallas Cowboys. Each green branch of the tree, bent under the weight of the colorful ornaments, became a page spilling over with our memories, heavy with our family history. But now I stared at the tree, incredulous at what I saw perched in its darkened branches. The glittery lime green ornaments, in the shape of letters that spelled out JOY, sparkled brightly in the dim room, even though no twinkling white lights illuminated them. I’d gotten several boxes of those ornaments for twenty-five cents each at an after-Christmas sale a few years ago. Last year, I pulled them out for the first time, when I was desperately seeking some joy in a season that only felt melancholy and impossible in the middle of my grief. I stuck them haphazardly in among the branches, and they balanced precariously, which was exactly how I’d felt: stuck and off-balance in this new life without Kevin. I hoped they’d remind me to feel something – anything – during the Christmas season, because I needed to. For me, for Kevin, but especially for my girl, who still deserved all the magic of Christmas. It sort of worked, I guess, but the bright green color got a little lost among the dark green branches and sparkling lights and the overwhelming assortment of rich colorful ornaments, and I’m not sure I remembered to look for the JOY when I walked by the tree. It was a hard Christmas. Well, now, with the electricity off and the tree in solemn darkness, there was no missing it. 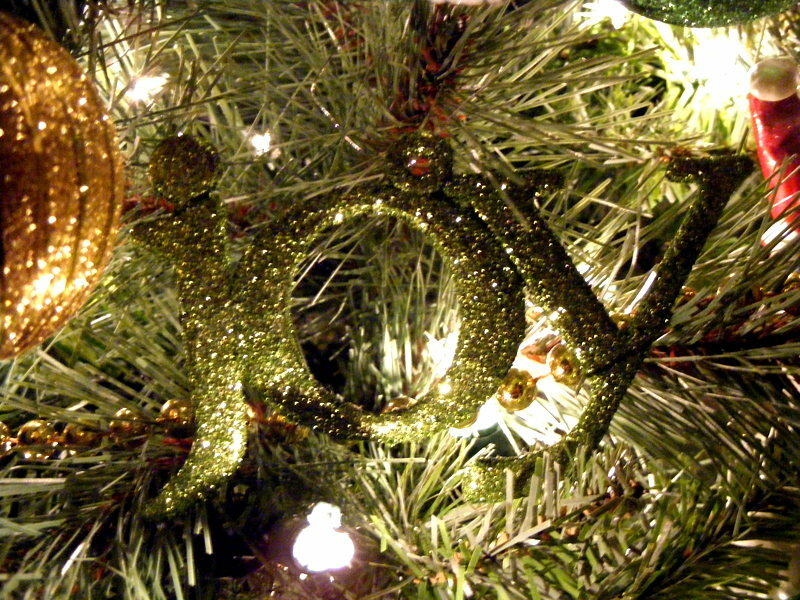 All over the tree, in all the hidden nooks and bent branches, JOY shone out brightly. In the midst of darkness, it shines. In spite of the darkness, it glimmers. Because of the darkness, it glows. And I needed to see it. Because Christmas is still hard this year. Kevin’s not here, and that’s not any easier to reconcile: the mourning and the magic. And in the midst of this season, I need to be reminded that God is still here, even when grief clouds my life and it’s hard to see His light, or any light, in all the sad, depressing shadows. He is still with me, with my girl, still guiding our steps and catching the tears. He is still holding Kevin close to His side, and me and my girl even closer, murmuring words of comfort, of peace. He is still bringing joy to our life. Joy in the memories, joy in the love, joy in the hope only He offers. When the darkness comes, joy shines ever brightly. The high pitch of her excited chatter reverberated down the hallway, stirring me from sleep. I pulled the pillow over my head, but the pull of her delight was too much. I sighed, fixed a smile on my face, and shuffled to the classroom, where she stood, nose pressed to the window, watching the barely-risen sun sparkle across the snow-covered backyard. When she turned at my footsteps, I smiled for real because the joy on her face…well, magic. To Kevin, snow meant Slow down, take a break, just watch and let it be. I envied him that perspective, because to me, snow is work. Shoveling the driveway and the sidewalk. Skating across the icy street to the mailbox. Dragging the trash dumpster to the curb, bumping across criss-crossed tire tracks, frozen slippery ice trails to the street. And the cold. Oh, I hate the cold. The bite of wind, the string of freezing rain. To his mind, life slowed down in the snow. To mine, it got more complicated. And that was the day. Sitting by the picture window in the front room, curled up in the recliner, cozy in his Cowboys Snuggie, sipping hot chocolate and watching the snow. As if it were a grand production God was putting on just for him and he didn’t want to miss one minute. There was something so pure about his delight in those frozen crystals. Magic. She has it, too. That watchfulness. That certainty that God is creating something beautiful just for her to enjoy. That instinct to stop. Just stop everything and enjoy and marvel and gaze with joy at the glittering wonderland before her. I need it. Whatever mysterious genetic enchantment allows them this peace, this stillness, this just be-ing. It’s Christmas and it’s harder than I thought it would be. Part of me needs to close my eyes and hide in my room until it’s done. Kevin’s not here to watch me put together toys, handing me the wrong screwdriver for the parts. He’s not lounging on the bed, watching me deliberate over the packages stashed in our closet. Christmas? Birthday? He’d ponder and point and I’d agree and sort. Cookies? Candy? Santa visits? Elf on the Shelf? I can’t summon any genuine emotion for these things, but our little Bear can. And does. These traditions are important to her, especially now. Everything connects us to Kevin, to her Daddy Bear. Keeping Christmas is keeping Kevin, so when she asks if we can still eat cinnamon rolls on Christmas morning, I answer, Yes, of course. We’re not doing half of what we usually do, and I feel both numb and guilty about it, but even that fraction of the yuletide list feels too hard right now. Yes, my aching heart cried out. Yes, teach me how to do that. Teach me how to sit and watch and wonder. Teach me how to set aside the complicated and embrace the simple. Teach me how to find the magic in the beautifully unique snowflakes that float gently from heaven. Teach me how to be still when it feels like my world fell apart and the heavy, sharp pieces are still crashing down, breaking me and burying me in grief, and my every instinct is to run and hide. Teach me the secret you and Daddy share. Teach me how to be, little Bear. Life really hurts right now and I just want to be. I knelt at the window beside her and we watched the snow drift down. The ground was already white with glittering sparkles and more came down and time slowed down and the world outside felt God-filled, with peace and hope. She sighed, was still, beside me. I was still and I heard him. And yes, my love, we were. And yes, life will be. With our Bear and our God, life will be beautiful again. Peace will drift down and cradle the brokenness and hope will sparkle and joy will glow. Kevin proposed to me on Christmas Eve, so that’s been on my mind a lot lately, as Christmas dances ever nearer. Beary is delighted, beside herself with visions of sugarplums, and I’m just trying to hold on through the whirl. Trying to keep Christmas in my heart, but the heart-pieces left are shattered and not big enough to hold all the joy that the season should bring. I’m managing by keeping our big traditions, but letting others slide. For this year, at least. For my Bear, I have to keep some Christmas, so we decorated our tree and staked down our inflatable yard decorations. We made some candy and hung our stockings. And I sorted through the Christmas movies, trying to decide which ones I could handle this year. So many we enjoyed as a family; so many we wanted to share with our Bear as she got older. I realized she’d never seen “A Christmas Carol” and it was one Kevin loved; he collected several versions to enjoy. He so much wanted to share it with her, but the timing was never right and now it’s just the two of us to carry on for him. I decided to do it, to watch it with her, and I approached it methodically, thinking that was my best bet for getting through Kevin’s tradition. We planned for it as a lesson, our reading unit for December. We read the book, read a Magic Tree House adventure about Charles Dickens, studied Victorian England, and culminated with the Kelsey Grammer version of the movie, eating popcorn and cuddling in Daddy’s chair. I was ready for the story to unfold, for the memories of Christmas past and Christmas present and Christmas future — on the screen and in my mind. I steeled myself, determined to keep emotion in check, to see the magic unfold through her eyes. I forgot about the music. The beautiful songs. Because with Kevin, I felt like I’d finally found home. My home, our home, where anything was possible. We searched for each other for so long. And when you find the one who finally fits, well, that’s home and you never want to lose it. We’d finally found our way there. Together. To a place called home. It’s hard right now, to be in our home but to feel like my real home, my heart, is gone. Not completely, I know, because he left behind a beautiful little girl, the image of him, and she fills this home we created with laughter and joy and energy. I love her so much and I thank God for her every day. She explodes with merriment. Her antics and escapades and imagination fill up the air and swell to the heavens and I know Kevin watches with wonder and delight, chuckling over his Little Bear. But there is still emptiness in my home, an emptiness in my heart. Everything is different now. And where before I heard the song and sang its lyrics at Christmas because it was our story, our journey to a place called home filled with love and family, now it’s all so different. Now I hear it and my heart splinters as Old Ebenezer Scrooge’s voice breaks with the realization of all he’s lost.